Along with birth and death certificates, marriage certificates are the real meat and potatoes of genealogy research. One of the great joys of them is that they're generally less susceptible to omissions and mistakes than the other certificates, since they establish the legitimate rights of future children and widows, and so were often prepared more carefully. It doesn't hurt, too, that there are generally fewer of them to search through than with births and deaths, a plus when you're delving through your family history! 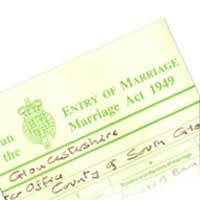 Much like birth certificates, valid marriages of all forms in England and Wales have only been recorded by the Registrar General since July 1st, 1837. That was also the date when civil ceremonies became legal. In church ceremonies, an "authorised person" (usually the vicar) records the marriage and sends quarterly details to the Registrar General. He then indexes them in both bride and groom's names. However, on a local level, the superintendent registrar normally indexes by church. So if you're looking locally in your genealogy research, unless you know in which church the marriage took place, you're likely to have a lot of dusty work ahead of you - a good genealogy tip is that looking in the national index of marriage certificates is much faster and more efficient. Prior to 1907, when it was allowed, the most common type of invalid marriage was a man wanting to marry his dead wife's sister. It wasn't until 1837 that Gentiles and Jews were permitted to intermarry - an instance where knowing the law can help in genealogy. Condition refers to their status - bachelor, widow, spinster, etc. From 1858-1952 a divorced groom would be listed as "the divorced husband of..." with the former wife's maiden name given. A divorced wife would have much the same listing. Where you have the precise ages of the bride and groom, it now becomes much easier to go back and find their birth certificates. If there's an indication of a previous marriage, you have an entirely new trail to explore for the family tree! If you know a marriage took place but you can't find the marriage certificate (which does happen on occasion), there could be a number of reasons. The marriage might have been common law, in which case the couple lived together without the benefit of a ceremony. Many common law wives described themselves as widows when registering their partner's death, making it hard for the real widow to draw a pension - they might even have changed their surname to his (in 1877 the penalty for this falsification was a month in jail of a £5 fine). This, of course, can cause frustration in genealogy, as you search for a marriage that never took place! If the marriage took place in Scotland, the Isle of Man or the Channel Isles, you would need to consult their registration systems. If the person married abroad, there might be no notification of it (the Public Records Office does, however, have indexes of marriage from about 50 different countries). You might not have the proper forename. The Wilfred Hinchcliffe you're searching for might really be John Wilfred Hinchcliffe. If you're searching by the bride's name, don't assume it will be her maiden name. The further back you go, the greater the proportion of marriages involving widows - fully 10% of the total in 1850. @KylieR - How sad :( Have you tried to trace the children via the census. The children/grandchildren may have had the story passed down to them. It would also help to know when it was that your family member was alive. Hi. I'm relatively new to this and have been trying to help my dad out somewhat with a family member with whom we've reached two dead ends (one quite literally!) Firstly, she seemingly disappears completely after a Census. There is nothing further on her to be found - certainly no record of death. We've come up with all manner of exciting and intriguing reasons why this might have occurred... Is there a less fanciful one as to why there would be no death record in the UK? Her children were sent to live with neighbours as far as we know, so presumably someone knew what happened to her or at the very least, that she was no longer around (she either took off and left the children behind or quite literally disappeared?) My great aunt told a story of how she "died of a broken heart" (suicide), though there's nothing to substantiate that. Also, there's no information on the father of her children (re cause of said broken heart - military man KIA) and they appear to have her maiden name. Is there anywhere else this information may be recorded? Thanks in advance!